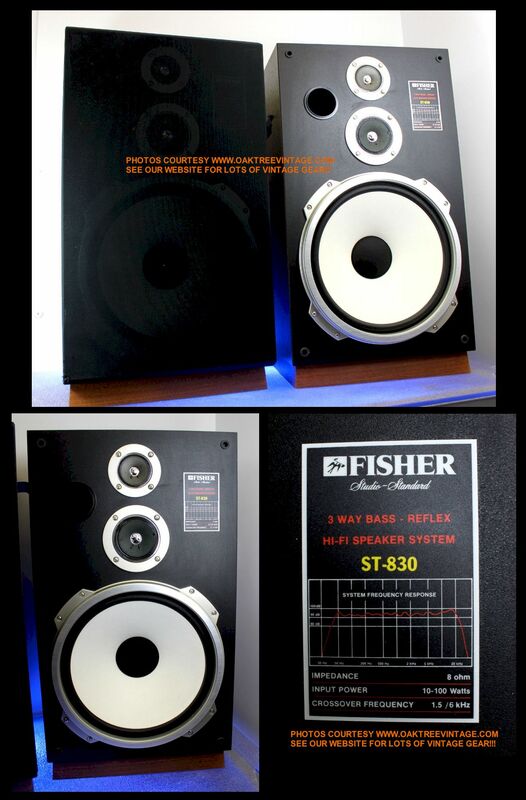 Fisher Replacement Speakers, drivers, spares & Parts. FISHER SPEAKER PARTS - USED / VINTAGE. Fisher Replacement Speakers for reference information, specifications and occasionally for sale. Fisher drivers & Parts / spares. Fisher DS-177, DS-810, DS-826, LX1, ST-420, ST-430, ST-510, ST-750, ST-830, ST-832, ST-920, ST-9415 / ST-9418, STV-410, STV-430, STV-720, STV-724, STV-827, STV-844, STV-873, STV-875, STV-880, STV-9535, X6000, SP-6B, XP-7, XP-7C, XP-9, XP-9b, XP-10, replacement woofers, tweeters, midranges, crossovers, cabinets, grills, speaker parts. 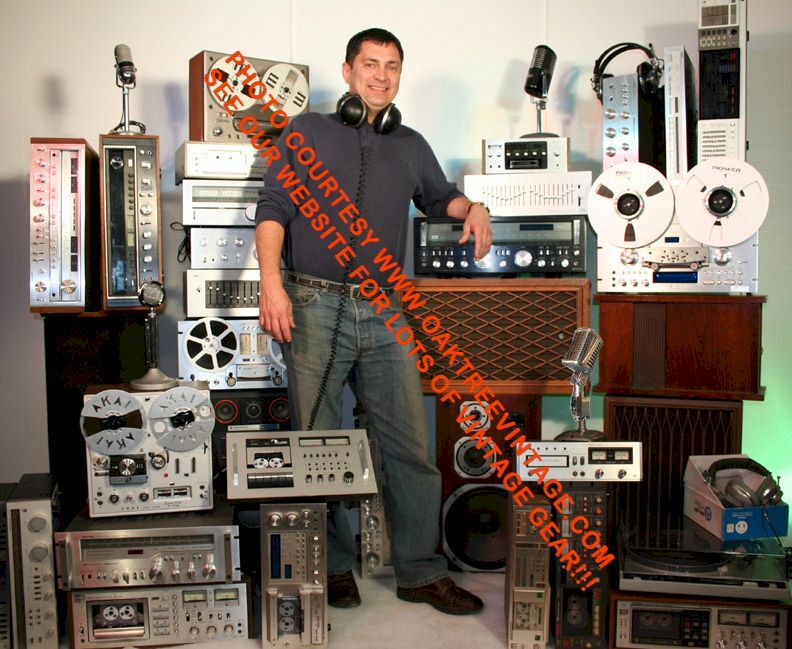 Fisher speakers / parts for Data Base info, specifications / specs, reference and occasional sale. 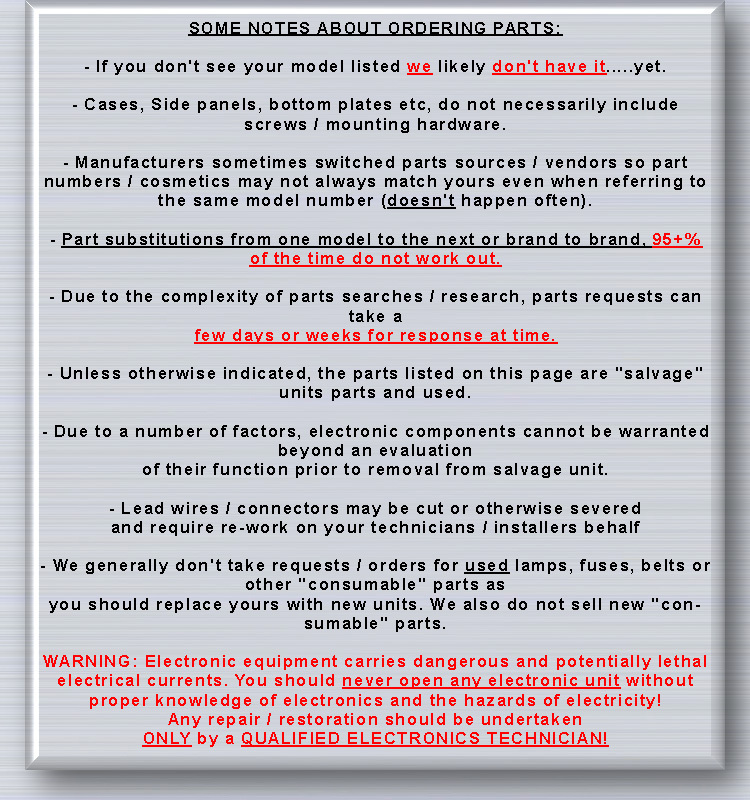 20% off sale on salvage speaker parts. Most of these components are "take-outs" from working speaker cabinets and unless otherwise noted are in perfect shape! Where necessary foam surrounds have been replaced and / or speaker has been professionally and correctly re-coned! JAPAN 12" ~50-70 Watts DCR= 4.3 Ohms U 1 $75. ea. Good Cond. Taiwan / R.O.C. 5" - DCR= 6.5 Ohms U 2 $35. ea. Good Cond. Korea 3" - DCR= 3.0 Ohms U 2 $30. ea. Good Cond. *Here's the issue with speaker grill sales. They end up being a disproportionate amount of money, relative to their purchase price, for packing and shipping, due to their large size, the 'custom' box and amount of foam board required for safe transit, so it is not uncommon for their pack / ship cost to be equal to, if not more than the cost of the part. Just FYI. Fisher DS-177 Cabinets / Cases Made in USA - - - U 0 Reference info ONLY. JAPAN 8" - 8 Ohms U 0 Reference info ONLY. but more MAY occasionally show up. Check back periodically. Stamped Steel frame. White Pulp cone w/ black 'cloth' dust cap. Coated Cloth surround. Ceramic magnet. DCR= 7.1 Ohms U 0 Reference info ONLY. DCR= 4.5 Ohms U 0 Reference info ONLY. but more MAY occasionally show up. Check back periodically. Stamped Steel, Square, Sealed frame. Black Pulp cone w/ 'chrome', Mylar dust cap. Coated Cloth surround. Ceramic magnet. JAPAN 3" - 4 Ohms U 0 Reference info ONLY. DCR= 3.5 Ohms U 0 Reference info ONLY. but more MAY occasionally show up. Check back periodically. Cast, aluminum, Radial, Bullet horn. Ceramic magnet. Made by Foster in Japan. DCR= ~7.8 Ohms U 0 Reference info ONLY. but more MAY occasionally show up. Check back periodically. Stamped Steel frame. Pulp cone w/ black 'pulp' dust cap. Coated Cloth surround. Ceramic magnet. DCR=4.5 Ohms U 0 Reference info ONLY. but more MAY occasionally show up. Check back periodically. Stamped Steel, sealed frame. Pulp cone w/ black 'pulp' dust cap. Accordion Coated Cloth surround. Ceramic magnet. 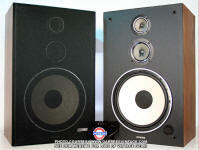 Original Woofers SC80662-1 10" - 8 Ohms U 0 Reference info ONLY. but more MAY occasionally show up. Check back periodically. Stamped Steel frame. Pulp cone w/ black 'pulp' dust cap. Coated Cloth surround. Ceramic magnet. Made by JVC. Original Tweeters FSA80492-1 ~.75" - - U 0 Reference info ONLY. but more MAY occasionally show up. Check back periodically. Mylar dome / diaphragm. Ceramic magnet. Made by Foster. Original Woofers 12101 / SC80653 12" - DCR= 4.3 Ohms U 0 Reference info ONLY. $65. ea. Great Condition. No rips, tears, creases, rubs, stains. Works well. Stamped Steel frame. White, Pulp cone w/ black 'cloth' dust cap. Coated, Cloth surround. Ceramic magnet. ST-830 / ST830 Fisher ST-830 / ST830 Midranges / Mids 80543-4CXA 2AX 5"
DCR= 3.2 Ohms U 0 Reference info ONLY. but more MAY occasionally show up. Check back periodically. Stamped Steel frame. Pulp cone w/ 'silver' Mylar, dust cap. Coated, Cloth surround. Ceramic magnet. Five small 'dimples' in dust cap in the shape of a 'star' or 'flower', but won't affect sound. Fisher ST-830 / ST830 Tweeters SA80442-4CX 3"
Great Condition. No rips, tears, creases, rubs, stains. Stamped Steel frame. Pulp cone w/ 'silver' Mylar, dust cap. Coated pulp surround. Ceramic magnet. Sealed Back, Stamped Steel frame. Pulp cone w/ 'silver' Mylar, dust cap. Coated pulp surround. Ceramic magnet. Working Condition. No rips, tears, rubs, stains. Decent Condition. Small snags / holes, and some staining. Frame solid w/ no breaks. Locating / attachment pins all intact. Original Woofers SC80699-2AX 15" 100 Watts 8 Ohms U 0 Reference info ONLY. but more MAY occasionally show up. Check back periodically. Stamped Steel frame. White, Pulp cone w/ black 'cloth' dust cap. Coated Cloth surround. Ceramic magnet. Original Midranges SB80533 ~5.5" - 4 Ohms U 0 Reference info ONLY. but more MAY occasionally show up. Check back periodically. Stamped Steel, Sealed frame. White, Pulp cone w/ black 'cloth' dust cap. Coated Cloth surround. Ceramic magnet. Made by Foster in Japan. (See also Fisher ST-920 & STV-844) ~2.5" 12 4 Ohms U 0 Reference info ONLY. Original Tweeters SSA80498-1 2" - N/A U 0 Reference info ONLY. but more MAY occasionally show up. Check back periodically. Piezo, Pulp cone. Made in Korea. 10" 60 Watts 8 Ohms U 0 Reference info ONLY. ~2.5" ~15? 8 Ohms U 0 Reference info ONLY. but more MAY occasionally show up. Check back periodically. Stamped Steel frame. Black Pulp cone w/ 'Chrome', Mylar dust cap. Coated cloth surround. Ceramic magnet. Original Woofers SC80781-1 15" - 8 Ohms U 0 Reference info ONLY. Original Woofers SC80761-1 10" - 8 Ohms U 0 Reference info ONLY. but more MAY occasionally show up. Check back periodically. Stamped Steel, 'deep' frame. White Pulp cone w/ 'Oversize' black 'cloth' dust cap. Cloth surround. VERY tiny Ceramic magnet, w/ smaller 'bucking magnet' added for 'video shielding. Original Tweeter SC80460-3 3" - 8 Ohms U 0 Reference info ONLY. but more MAY occasionally show up. Check back periodically. Stamped Steel, Sealed frame. Black Pulp cone w/ 'chrome', Mylar dust cap. Accordion, coated, pulp surround. Ceramic magnet. but more MAY occasionally show up. Check back periodically. Stamped Steel, 'deep' frame. White Pulp cone w/ black 'cloth' dust cap. Cloth surround. VERY tiny Ceramic magnet, w/ smaller 'bucking magnet' added for 'video shielding. Original Midrange SC80564-3 ~2.5" - 8 Ohms U 0 Reference info ONLY. (see also Fisher STV-827 & STV-873) 12"
4.5lbs total weight. - 8 Ohms U 0 Reference info ONLY. but more MAY occasionally show up. Check back periodically. Stamped Steel frame. White Pulp cone w/ black 'cloth' dustcap. Cloth surround. Ceramic magnet, w/ smaller 'bucking magnet' added for 'video shielding. Original Midrange SC80564-1 4" - 8 Ohms U 0 Reference info ONLY. but more MAY occasionally show up. Check back periodically. Stamped Steel, Sealed frame. Black Pulp cone w/ 'chrome', Mylar dust cap. Accordion, pulp surround. Ceramic magnet, w/ smaller 'bucking magnet' added for 'video shielding. 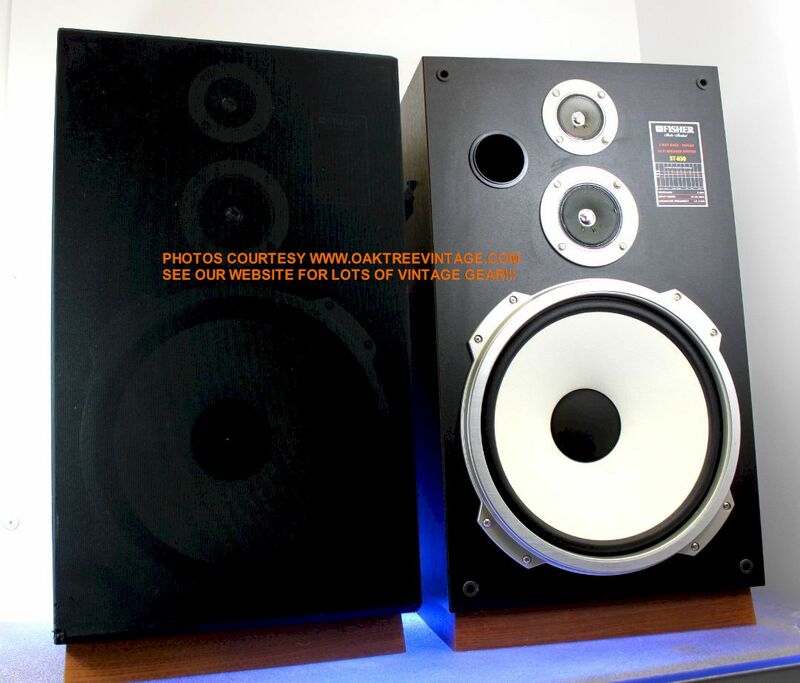 Original Woofers SC80741-2 15" ~120 watts 8 Ohms U 0 Reference info ONLY. but more MAY occasionally show up. Check back periodically. Stamped Steel frame. White Pulp cone w/ black 'cloth' dustcap. Cloth surround. Ceramic magnet, w/ smaller 'bucking magnet' added for 'video shielding. Made by 'Foster' in Japan. Original Midranges SC80535FX ~4.5" - 4 Ohms U 0 Reference info ONLY. but more MAY occasionally show up. Check back periodically. Stamped Steel, 'Semi-Sealed' frame. Black Pulp cone w/ black 'pulp' dust cap. Coated, Accordion surround. Ceramic magnet. Made by 'Foster' in Japan. (See also Fisher ST-920 & STV-844) ~2.5" - 4 Ohms U 0 Reference info ONLY. but more MAY occasionally show up. Check back periodically. Stamped Steel frame. White Pulp cone w/ black 'cloth' dust cap. Cloth surround. Ceramic magnet. Made by 'Foster' in Japan. Original Tweeters SA80464-3 3" - 8 Ohms U 0 Reference info ONLY. but more MAY occasionally show up. Check back periodically. Stamped Steel frame. Black Pulp cone w/ 'Chrome', Mylar dust cap. Accordion, Cloth surround. Ceramic magnet, w/ smaller 'bucking magnet' added for 'video shielding. Made by 'Foster' in Japan. Original Midrange SC80464-2 ~4" - - U 0 Reference info ONLY. but more MAY occasionally show up. Check back periodically. Stamped Steel, Sealed, frame, w/ square mounting flange. Black, Pulp cone w/ 'chrome', Mylar dust cap. 'Accordion', Coated Cloth surround. Ceramic magnet, w/ smaller 'bucking magnet' added for 'video shielding. Made by 'Foster' in Japan. Original Tweeter SC80564-2 ~3" - - U 0 Reference info ONLY. Original Tweeters FSA80461-5 ~2.5" - DCR=4.6 Ohms U 0 Reference info ONLY. but more MAY occasionally show up. Check back periodically. Stamped Steel, Rectangular Sealed frame. Black Pulp cone w/ black 'Mylar' dust cap. Ceramic magnet. Made by Foster in Korea. 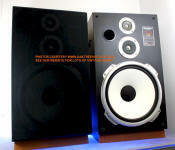 WOOFERS SC80641-1 10" - 8 Ohms U 0 Reference info ONLY. $55. ea Stamped Steel frame. Pulp cone. Cloth dust Cap. Foam surrounds. Ceramic Magnet. 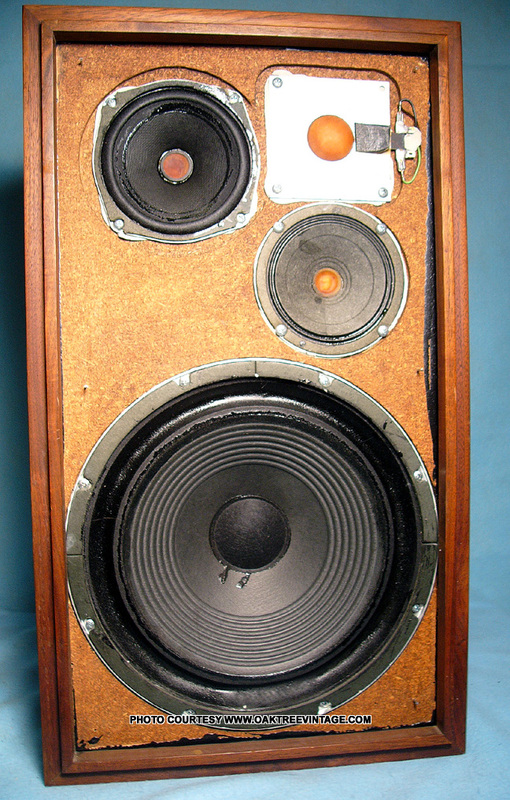 (Alternative XP-6B, XP6B woofer) 10" +4dB over W149 4.4 DCR U 0 Reference info ONLY. (Alternative XP-6B, XP6B woofer) 10" -4dB under W208 5.7 DCR U 1 $55. ea. Good Cond. reading) U 2 $35. ea. Good Cond. (SEE ALSO XP-6B, XP-7, XP-9B, XP-12) 1.5"
reading) U 0 Reference info ONLY. DCR = 3.7 Ohms U 0 Reference info ONLY. $55. ea Stamped steel frame. Ribbed, Pulp cone. Coated Cloth Surround. Cloth dust cap. AlNiCo magnet. DCR = 7.6 Ohms U 0 Reference info ONLY. $55. ea Stamped steel frame. Pulp cone. 'Accordion' Coated Cloth Surround. Cloth dust cap. AlNiCo magnet. WOOFERS CS-80609 12" - 8 Ohms U 0 Reference info ONLY. $55. ea Stamped steel frame. Ribbed, Pulp cone. Reverse, Coated Cloth Surround. Cloth dust cap. Huge Ceramic magnet. Lower-Midrange CS-80505 12" - 8 Ohms U 0 Reference info ONLY. DCR = 6.8 U 0 Reference info ONLY. $55. ea Stamped steel frame. Pulp cone. Coated Cloth Surround. Pulp dust cap. Huge, Square, Ceramic magnet. Tweeter SA-80401 / 137-72xx ~2.5" - - U 0 Reference info ONLY. $55. ea Stamped steel frame. Pulp cone. Coated Pulp Surround. Pulp dust cap. Ceramic magnet. DCR = 3.5 Ohms U 0 Reference info ONLY. $55. ea Stamped steel frame. Ribbed, Pulp cone. 'Reverse' coated cloth surround. Cloth dust cap. AlNiCo magnet. DCR = 7.4 Ohms U 0 Reference info ONLY. $55. ea Stamped steel frame. Pulp cone. 'Accordion' coated cloth surround. Cloth dust cap. AlNiCo magnet. woofer, 12" - 8 ohms (5.3 DCR) U 1 $95. ea. Good Cond. w/ 'Reverse' coated cloth surround, ribbed paper cone and AlNiCo Magnet. Wire attachment lugs are 'solder' type. Replacement for Fisher XP-9B woofer, w/ 'Reverse' coated cloth surround, ribbed paper cone and AlNiCo Magnet. Wire attachment lugs are 'solder' type. 12" - 8 ohms (5.3 DCR) U 0 Reference info ONLY. (SEE ALSO XP-6B, XP-7, XP-9B, XP-12, XP-15) 1.5"
control-8 XP-9b / XP9b 4-way - U 2 $45. ea. Good Cond. veneer - - - U 0 Reference info ONLY. XP-9b / XP9b XP-9b / XP9b Logo - - - - U 2 $20. ea Good Cond. DCR=3.9 Ohms U 0 Reference info ONLY. but more MAY occasionally show up. Check back periodically. Stamped Steel frame. 'Reverse' coated cloth surround, ribbed paper cone and AlNiCo Magnet. Wire attachment lugs are 'solder' type. Mid-Bass M-124XA midrange / mid-bass 8"
DCR= 9.8 Ohms U 0 Reference info ONLY. but more MAY occasionally show up. Check back periodically. Stamped Steel frame. 'Reverse' coated cloth surround. Pulp cone. Cloth dust cap. AlNiCo Magnet. Wire attachment lugs are 'solder' type. If you're looking for a great place for great place to purchase new foam surround kits, replacement surrounds, or to have your woofers, sub woofers / subs, re-foamed or re-coned, we recommend either 'Orange County Speakers' or 'Parts Express'. They have QUALITY parts and do QUALITY work.